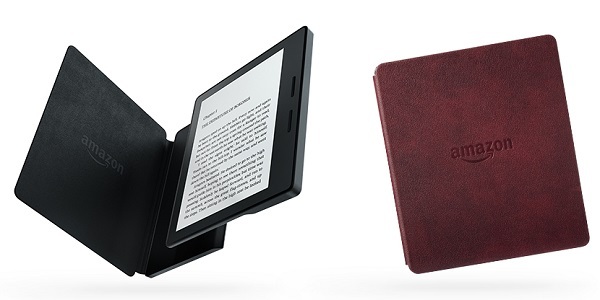 Amazon unveils its thinnest and lightest Kindle, the Oasis. Eight years ago, Amazon introduced Kindle, making it possible for the first time to think of any book and start reading it in seconds. Since then, Amazon has introduced new Kindle e-readers that are smaller, lighter, and faster-all on a mission to make the device disappear so you can lose yourself in an author's story. Today, Amazon took another step toward this mission: introducing Kindle Oasis-the eighth generation of Kindle-crafted from the ground up for readers, with an all-new, incredibly thin and light design, plus an included charging cover that delivers months of battery life. Kindle Oasis is the newest addition to the Kindle family. By design, Kindle e-readers are purpose-built for reading so you can lose yourself in a book. Unlike tablets and phones, dedicated e-readers don't distract you with social media, emails, and text messages. They don't beep at you or tire your eyes when you read for hours at a time. The new Kindle Oasis is unlike any Kindle you've ever held. With an incredibly thin display and an ergonomic grip, Kindle Oasis weighs just 4.6 ounces and is just 3.4 mm at its thinnest point-30% thinner on average and over 20% lighter than any other Kindle. To achieve this, Kindle Oasis has a featherweight polymer frame that is plated with metal by structural electroplating-this makes the device incredibly light while ensuring it has the strength and rigidity of metal so it is resilient enough to take anywhere you want to read. Kindle Oasis is designed for extended reading sessions-with an entirely reimagined shape, Kindle Oasis shifts the center of gravity to your palm, to rest in your hand like the spine of a book so that the device feels balanced for one-handed reading. Effortlessly turn the page with either the touch display or physical buttons. Oasis is comfortable to read on with either hand-a built-in accelerometer detects whether you are reading with your left or right hand, and automatically rotates the page and page turn buttons to match. Kindle Oasis introduces a new dual-battery system-as soon as you connect the cover to Kindle Oasis, the battery in the cover begins recharging Kindle Oasis automatically. The battery in the cover uses a custom cell architecture that optimizes power and energy while keeping an incredibly small and light form factor and delivering months of battery life. You can charge the device and cover simultaneously while both are snapped together and plugged in. Plus, a new hibernation mode minimizes power consumption when your Kindle is inactive. The included charging cover is made of high-quality leather and is available in black, merlot, or walnut. The cover opens like a book and fits closely around the bezel, waking Kindle Oasis when opened and putting it to sleep when closed. Twelve magnets form a secure and solid attachment between the device and cover, while ensuring it is easy to detach when you choose to read without the cover. Kindle Oasis features the latest generation high-resolution 300 ppi Paperwhite display for crisp, laser-quality text. A redesigned built-in front light features 60% more LEDs for our brightest Kindle display ever and leverages new cylindrical diffractive patterns to increase the consistency and range of screen brightness for improved reading in all types of lighting. The new Paperwhite display on Oasis is the first Kindle display designed using a ground-breaking 200 micron display backplane that is as thin as a single sheet of aluminum foil, but is robust enough for you to throw in your bag and take with you on-the-go, combined with a custom cover glass engineered from chemically-reinforced glass. Reads like a book-Thanks to a built-in front light, read without eyestrain or glare, even in bright sunlight. Weeks of battery life-Battery life is measured in weeks, not hours. No set-up required-Kindle arrives pre-registered so you can start reading immediately. Whispersync-Saves and synchronizes your last page read, bookmarks, and annotations across all of your devices and Kindle apps, so you can always pick up where you left off. Worry-free archive-Automatically backs up your Kindle books in the cloud, so you never need to worry about losing your books-re-download your books wirelessly anytime for free. Goodreads-Kindle is integrated with the world's largest site for readers and book recommendations, with over 50 million members, 1.3 billion books added, and 47 million book reviews. X-Ray-Explore the "Bones of the Book-see all of the passages across a book that mention relevant ideas, fictional characters, historical figures, places, or topics of interest. Word Wise-Available on many popular English language titles, Word Wise makes it easier to enjoy and quickly understand more challenging books. Short and simple definitions automatically appear above difficult words, so you can keep reading with fewer interruptions. Family Library-With Kindle and Kindle reading apps, you can access not only your own books, but also books from the Amazon account of a spouse or partner. Kindle FreeTime-Gives parents a simple, engaging way to encourage kids to spend more time reading. Hand-select books for your kids to read, and achievement badges are earned when they hit reading milestones. Time to Read-Tells you how much time it will take to finish a chapter or a book based on your personalized reading speed. Vocabulary Builder-Compiles words you look up in the dictionary into an easy-to-access list. Use these lists to quiz yourself with flashcards and instantly see words in context. Share your favorite passages-Share book recommendations, highlighted sections, and meaningful quotes with friends via Facebook and Twitter. Smart Lookup-Integrates a full dictionary definition with other reference information via X-Ray and Wikipedia. Custom-Built Typesetting Engine-Word and character spacing, with hyphenation, justification, ligatures, and kerning lays out the pages just as the author intended. Kindle Oasis, the thinnest and lightest Kindle, with an all-new ergonomic design, page turn buttons, and an included leather charging cover which, when added, provides months of battery life through a unique dual-battery charging system, just $289.99. It is available for pre-order around the world and will start shipping in the coming weeks. Order now at www.amazon.com/kindleoasis.